People who know me would, I hope, consider me to be straight-talking – I call it as I see it. But I can say hand-on-heart that self-interest doesn’t particularly drive me, so I hope people read my general commentaries in that light. But back to calling at I see it. I’m not completely bereft of all tact, but my mother always noted that I had a certain ‘sledge-hammer diplomacy’ which might from time-to-time get me into trouble. I know also that a golden rule of business is not to ‘poo-poo’ on the competition. Unfortunately the world of SEO is highly prone to suppliers making claims and setting expectations that they all too-often fail to live up to. So sometimes I shout out when I see something I don’t quite agree with. opinion) lacking a basic understanding of SEO. professionals whose clients have availed of this service? there’s a few forums complaining about it. actually web professionals with a track record in SEO/web development. IE * over 210 million active/deleted domains. > actually web professionals with a track record in SEO/web development. responsible for the “web check”. previous work on their site. Nor is there any mention of SEO work. they are for the task. forms. I wouldn’t rate them for auditing. there may have been multiple phases. anyone is interested you can easily setup a login and look for yourself. runs to five (it was awarded on a regional basis). Very interesting to see the companies who won the contracts. indicate significant web development or SEO experience? I have seen the exact same thing with the County Enterprise Boards. country I think?) which was excellent. how you make that kind of expert view filter down to the county level? session to the floor and answered the questions of the attendees? It was like a break-out session in one of the smaller rooms? Or am I thinking of a different EI event in Crokers last year? Only problem is that none of those speakers has a background in search. role Google plays in our lives. 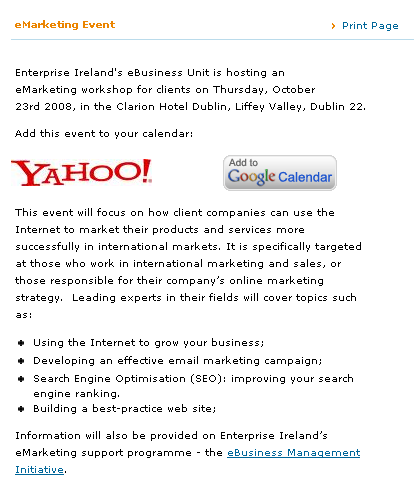 different EI event in Crokers last year? >>>Only problem is that none of those speakers has a background in search. could re-phrase you comment so it’s a bit clearer? not accurate and should be clarified. of experience in executing campaigns and training businesses on SEO and SEM. > not accurate and should be clarified. > strategic online marketing work. they were positioning themselves as SEOs. space. If you don’t implement you surely cannot be an expert? I think I’m pretty qualified to speak my mind on this I believe. who actually work in that field. considered them to be SEO experts. > country I think?) which was excellent. > how you make that kind of expert view filter down to the county level? Dublin is merely a data centre. but the only true test is to judge them on the results of their work. expert. And in the voodoo world of SEO, the risk is even greater. It struck me that “Search Engine Optimisation (SEO): improving your search engine ranking.” would require a speaker with a background in SEO. So I made my comment to that effect. I didn’t disparage any of the speakers. In fact I even sent a message stating that I thought they were excellent speakers for a general event. I hope that John Coburn of PraxisNow hasn’t taken offense at any of my comments – but if so please accept my apology John. pursue this further but that’s hardly a reason to censor him. Now in full fairness to Ralph he immediately sent me a mail apologising for the above message, which he had not meant for general distribution. The EI Lyris website is blocked with a 403, and when the site returns the entire Web Check thread, together with the new thread containing Ralph’s email, have been deleted. No explanation, no ‘how’s your uncle’, no nada. So what I read from this is that one Aileen O’Toole – MD, AMAS took umbridge to my comments and sought to have something done. All via back channels. I don’t think that the thread disappeared as a result of Aileen’s intervention, but I still cannot wrap my head around the fact that rather than delete the single message that went out in error the mods delete the entire thread. I think that will be my last contribution to EI’s mailing list. Thanks for dropping be the blog, and clarifying the above. I’m really surprised by the number of sites you’ve worked on, which is cool. I really hadn’t realised you had expanded your SEO offering – do you mind me asking how many people you have working on SEO, and are they in-house? It would probably take me about 4 years with my processes to work on that many sites, but maybe we’re comparing apples with oranges? I’m afraid I wont be about for the EI event, so I’ll have to wait to hear about the hot topic from coverage of the event. I know one hot topic is the recent change to algorithmic anchor text weighting? Let me know after the event – I’m now wondering what this could be! I’ve dropped you as email on this.